It might sound futuristic, but the techniques behind Corvix have actually been around for a while. 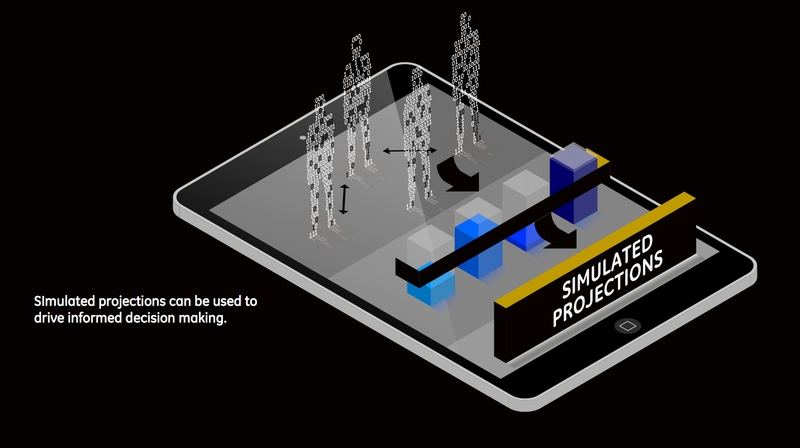 The platform uses agent-based modeling to build, essentially, a reasonable facsimile of some sort of complex system and then simulate its evolution over time. The “agents” represent the atomic units of those systems, such as individual people in the case of human populations or perhaps cells in the case of a biological simulation. They act according to a set of rules in any given situation, which is how the models are able to keep the simulations progressing. 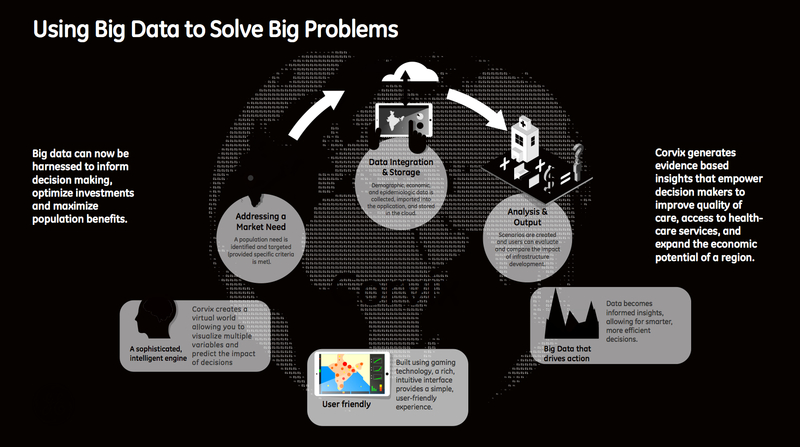 However, thanks to the advent of big data, GE Healthcare Chief Economist Mitch Higashi thinks the time is right for a platform like Corvix to provide some real value to real-world decisions. There’s enough raw computing power, machine intelligence and data-modeling expertise to start doing fast, accurate simulations over very large and complicated datasets. Also, advances in user-interface design have made these types of models more consumable: GE’s Corvix uses a game-like UI “that any 10-year-old can figure out how to use in 10 minutes,” Higashi said. The first live run for Corvix happened in the state of Andhra Pradesh in India, where the system simulated a population of 80 million people in order to figure out where to build hospitals and medical training centers over the coming years. The GE team used two census datasets and one health care survey in order to build what Higashi calls “a reasonable representation of 80 million people,” as well as a map of India’s existing hospital and energy grid. Health care analysts studying the problem of where to build can drag a new hospital over an area on the map and see how the situation plays out, Higashi explained. The original plan, said Chaitanya Sarawate, GE’s head of health economics and reimbursement for India, was for the Public Health Foundation of India to invest $2 billion building training institutions in different cities over the next five years. Corvix suggested some possible changes in location of those institutions, including placing two institutions in the country’s most-populous state, Uttar Pradesh, instead of just one as was originally planned. The advice is part of a report from the foundation to India’s Minstry of Health, which will make the ultimate decision. Developing countries such as India are great places to use this type of technology, Higashi explained, because they are doing greenfield investing in areas such as health infrastructure and a lot of good can happen if they get it right off the bat. The problem, Sarawate noted, is that they often lack detailed data that can help governments make objective comparisons — that’s the kind of stuff a company like GE, in this case, can track down and try to feed into a model that takes into account its relative importance. In fact, GE is already working on projects with other governments in India, as well as with private organizations and governments in other developing countries. GE has bigger plans for Corvix, though, including deployments in countries like the United States, and possibly into different areas within health care and some outside of health care. Ruslan Horblyuk, director of health economics for GE Healthcare, said deploying Corvix in developed economies will probably be a bit easier because there’s often more data available to choose from when building the models. “You do need a lot of data, there’s no doubt about it,” he explained, but you also need the right data to avoid making the models too simplistic on the one hand or too complex on the other. So, the more data available on specific diseases, for example, the deeper GE could go on modeling its progression over time — maybe across certain demographic groups or down to the level of a single organ. If exact data (e.g., literacy or disease state) aren’t available for people, there might be proxy data points available that could serve the same purpose. Independent agents act on their own. Horblyuk points to the U.S. Affordable Care Act (aka Obamacare) as a good example of where Corvix could provide value. As hospital chains grow larger but also try to improve their efficiency, an agent-based model could help them figure out how to make the best use of their available infrastructure. Maybe that means targeting certain illnesses in certain geographies, or moving from general-purpose facilities to facilities focused on treating specific conditions. Feature image courtesy of Shutterstock user discpicture.